How to Clean a Cast Iron Grill with Kosher Salt and Paper Towels. Who knew? The kosher salt acts as an abrasive agent to rid your grill of stuck-on food. 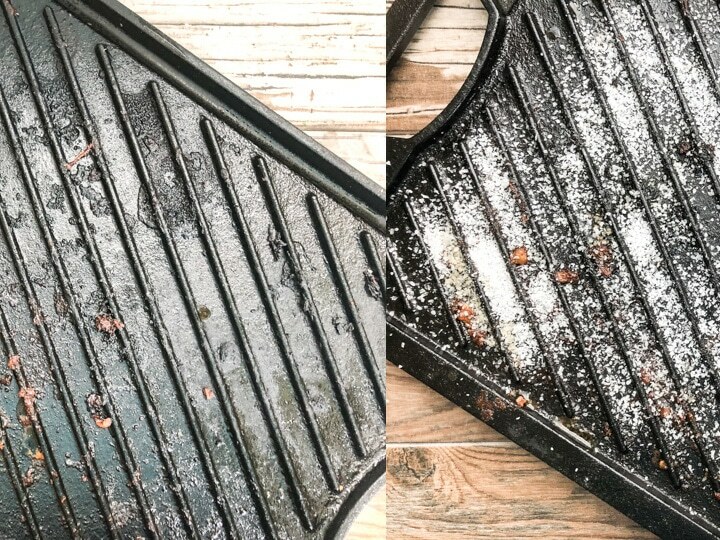 This effective cleaning method will turn your cast iron grill from looking gritty and gross to looking brand spanking new. Cleaning a cast iron grill can seem overwhelming, a bit of a burden, and worrisome. I get it… trust me. If you’ve ever experienced those feelings when it came to using your cast iron grill, I hope that changes after reading this post. 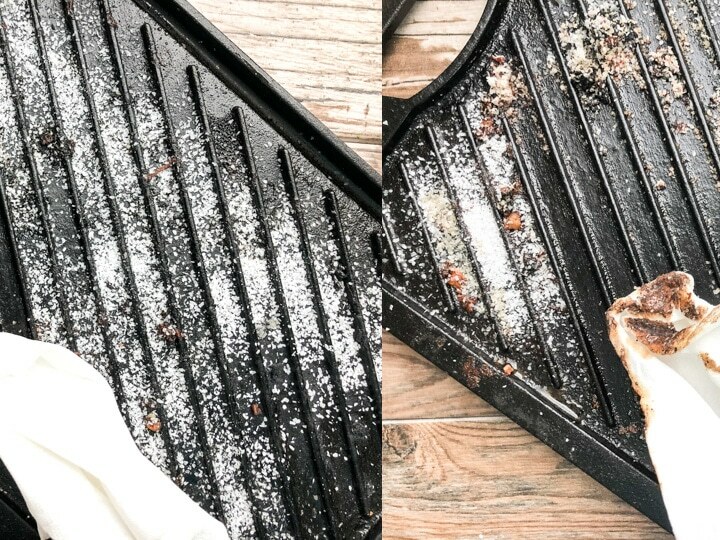 Today, I’m sharing a simple cleaning method that has made me fall in love with my cast iron grill. Once I adopted the method of using kosher salt and paper towels to clean the grill grates. It was on from there. I didn’t feel intimated when I would pull from the cabinet or when my family requested grilled chicken or shrimp. This was huge for me, for one, I had this cast iron cookware and secondly, I wanted to reap the benefits of cooking with cast iron. I was finally motivated to put those negative feeling behind me and learn a quick and sure fire way of getting my cast iron grill clean while not feeling like it was a chore to use. 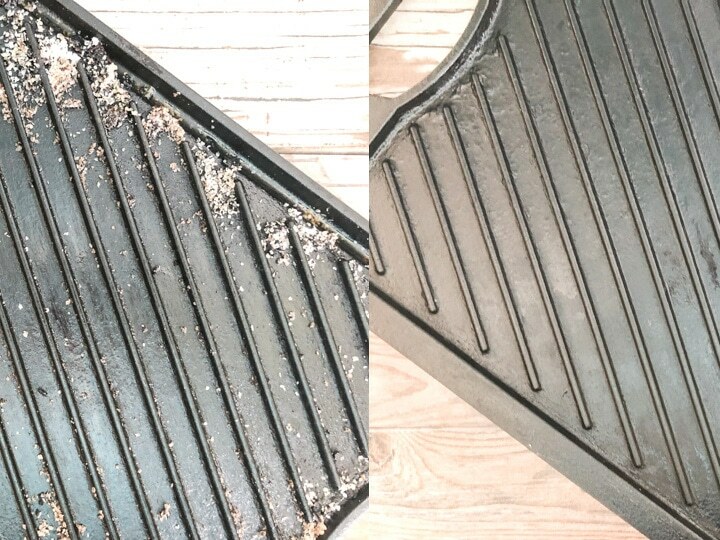 So, you’ve gone through the process of cleaning your cast iron grill… now what? This next step is very crucial which is the seasoning component. Yes, it is important to season a cast iron grill or skillet after each use. Seasoning your cast iron grill or skillet after each use will prevent it from rusting, will keep is looking new. With proper cleaning and seasoning, your cast iron grill will last forever.